Chelsea Midfielder: I've won titles and made history. I’m very happy at Chelsea. 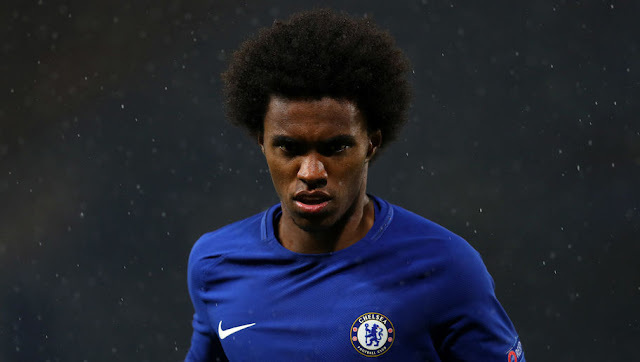 Chelsea midfield sensation Willian has revealed how happy he is to remain at Chelsea despite continued speculation of a possible move to Manchester United this past summer. Willian is outstanding and it's as simple as that. For him personally, since he became our Player of the Year in the nightmare season of 2015-2016 when he stood head and shoulders above everyone else for levels of commitment, performance and desire, he has not had everything his own way for one reason or another. Last season he suffered the devastation of losing his mother who unfortunately passed away. Up to that point, Willian had been a regular starter in the side and had been playing well. Granted extended compassionate leave by the club to mourn with his family, when he came back he faced a battle to try and get back into the side due to the impressive goal-scoring form of Pedro. You could argue it's been that way ever since. So to last summer and the continued speculation from the press that Jose Mourinho wanted to re-sign the 29-year-old but nothing ever materialised. Speaking recently here, Willian has revealed that he still remains happy at Chelsea and what he describes as one of the biggest clubs in the world. “When I came to London, there were other clubs interested in my football - Liverpool, Tottenham as well as Chelsea. I was just waiting for the negotiations to be completed. My agent was talking to the clubs. I was just waiting for the decision. In the end, I ended up going to Chelsea. When I understood they were really keen to sign me, I said my decision was made. I wanted to go to Chelsea. I've won titles and made history at Chelsea. I've experienced incredible moments at one of the biggest clubs in the world. I think I managed to keep improving my football even during difficult periods for the team. I've managed to maintain a high level of performance. I’m very happy at Chelsea. I just try to improve year on year. And it’s been happening." - Source: The Sun. I love Willian as a player because he has it all with blistering pace to go with it. He can beat players and leave them standing, waltz around them, knock the ball passed them when they come flying in to challenge him and collect it like they wasn't even there, he can score goals from anywhere and can pick a pass to unlock the defence we face to make the difference. Let's also not forget his willingness to work hard for the team without the ball too! Willian is unfortunate I think it's fair to say in that he came back to the club with two players in his position playing at the top of their games, in a team that was really firing. It's difficult to force your way in but when he has done, he is excellent as usual. He will be disappointed to have missed out on starting against Atletico Madrid and Manchester City this passed week but I believe that he will be there to make a difference for us in both the Premier League and Champions League this season.